I don't usually write about behind-the-scenes procedural stuff on TLA because 1) I don't think it's very interesting to most people and 2) sometimes our procedures change and I don't want to publicly commit to something until I'm absolutely sure I can stand behind it for the long-term. However recently, I made a big change to the way The Lingerie Addict handles product reviews. 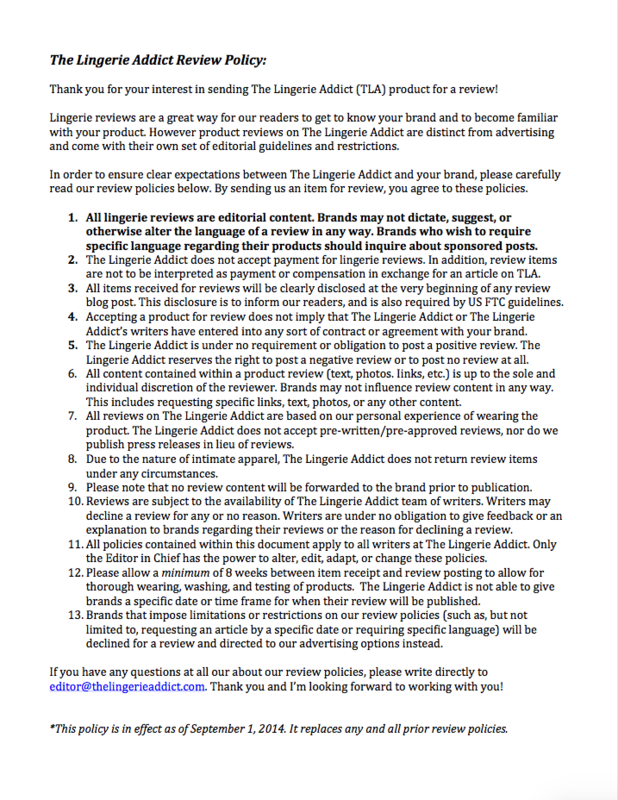 I sincerely believe this change is for the better (better for the site, better for our readers, better for our writers, and better for brands), but it made me realize I've never once shared the TLA product review process and what a "review" means on The Lingerie Addict means. So here we go! It's time to give a little peek behind the curtain. The most important thing to know is that product reviews on The Lingerie Addict are editorial, not advertising. That's been our stance from the very beginning and it translates into two important policies. One, brands cannot pay for a lingerie review on The Lingerie Addict. We do not accept money (or gifts or food or anything else) in exchange for product reviews. Reviews are completely isolated from the advertising pipeline, to the point that I don't personally review products from brands who are also talking about ad space. Individual columnists are 100% in charge of their own reviews. They decide what they want to talk about, how they want to talk about it, and what kinds of photos they want to take of the product. Second, brands cannot dictate the content of reviews to us. Brands are certainly welcome to send myself and my columnists press releases, to tell us major features or benefits of their products, or to highlight certain aspects of their company. However, brands have never been able to send us a product and subsequently tell us what to say about that product. Why? Because that's not a review. That's an advertisement. Our review policies, from when we accepted brand-sent items for review. All brands were required to both read and send written confirmation indicating they understood and agreed with these policies before we accepted their products for review. 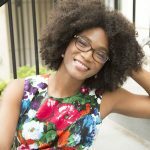 As the site's Founder and Editor in Chief (but also as someone who buys and wears lingerie myself), I take product reviews on The Lingerie Addict very seriously. I'm also incredibly lucky and fortunate to have writers who feel the same way. The point of a lingerie review on TLA is, first and foremost, to inform our readers. Reviews are explicitly written with lingerie customers in mind. Our goal when writing a review is not to give brands glowing praise (although sometimes that happens), but to help our readers make more informed purchasing decisions. Items are worn multiple times, and those items which can be safely laundered at home are usually washed also...all before the review is ever written. We want our product reviews to align as closely with what you'd experience as a customer - which is also why we don't give brands advance notice when we're reviewing a product. Sometimes our review process means a brand gets a negative or less-than-stellar review. Negative reviews aren't published to "punish" a brand. They're published to give our readers adequate information, so that even if they choose to buy from a brand (because not everyone cares about perfect fit or perfect stitching or what have you), they know what to expect. Conversely, when we give a glowing recommendation and say we love a product or company, you know we're being honest. We don't praise a brand unless we feel they're truly worth it. Even if you disagree with us (which is fine), I want you to know our reviews represent our honest opinions. Because that's what you deserve, and what you should expect from us. Unfortunately, our review policies are at-odds with many current brand and media norms. Over the years, we've had a number of instances where companies believe we should essentially lie to our readers - whether it was about fit, quality, size, selection, or something else. It became blatantly obvious brands weren't reading our policies (or at least weren't taking them seriously!). My writers began to get burned out from the misplaced wrath of brands, and it was taking its toll on me as well. Coordinating reviews could take hours, with brands often treating my team and myself as though they were doing us a favor by offering "free" product with strings attached. Gradually, I realized our approach to reviews needed to change. Late last year, I started to ask myself: "What would happen if we just stopped accepting review products from brands?" It was an intimidating line of thought. Product reviews are the bread-and-butter of content when it comes to lingerie blogging, and TLA is no exception. Over the last 9 years, we've published over 250 lingerie reviews...that's over 10% of our total content (more than 2,000 articles)! However, when I sat down and looked at what these product reviews really cost - in terms of time and energy and, in the most extreme cases, insults and harassment - I realized there really wasn't any other way. If we wanted to keep offering reviews, TLA had to be fully independent. In January, The Lingerie Addict officially discontinued the practice of accepting brand-sent products for review. That announcement was first only made internally to TLA's writers and editors, but I want to make it public today. Today, all our lingerie reviews are of an item a columnist either purchased for themselves or of an item that was purchased for them by TLA. At this time, there are no exceptions to this policy (although, full disclosure, we do have a hosiery review coming up that predates this new policy, so don't be too worried when you see it). Six months after making this decision, I think it's one of the best things we could have ever done. Now, TLA can review items we (and hopefully you) are interested in...as opposed to items from the companies with the biggest PR budgets. We're not limited to freebies, and we're not bound by press embargoes. This year alone, we've reviewed everything from a custom plus size Hopeless Lingerie set to a luxury I.D. Sarrieri gown to a lavishly embroidered Japanese lingerie set - items that will never be a part of the lingerie PR circuit. The breadth and depth of our lingerie reviews are poised to grow at an extraordinary rate, and it is my hope that we'll hit all the major lingerie brands (and then some) in the next year or two. My writers are also more excited than ever about reviews, and I feel like you can sense their renewed enthusiasm. I rarely post about the business side of running TLA, because, as I mentioned earlier, most of it is rather dull. That said, I hope this new policy helps you to understand what we've been up to, why you're seeing more reviews here, and also why certain brand reviews you might see elsewhere probably won't show up here. I also want you to know, in a media climate where it's increasingly difficult to distinguish between what's editorial and what's advertising, that TLA is more committed than ever to making sure you get our honest opinions and that we're up-front about what we're doing. When we accepted brand-sent products, that disclosure was always at the top of the post. Even now, we still disclose if a product was purchased by me (as TLA's Editor) or by the writer themselves as a personal purchase. Because I think it's important for you to have context from the very beginning. And without revealing too much, I want you to know this is the first of several steps towards making The Lingerie Addict more independent. As always, I want to thank you for taking time out of your day to read TLA. There's a lot of stuff happening behind the scenes right now, which is why we're publishing less and also why you're seeing less of me, but my commitment to making The Lingerie Addict the very best resource it can be is unwavering. And I'm glad you're here. Cora, I just discovered your blog last night and I’m thrilled to read the details your review process. I will definitely use you all as a go-to place for lingerie advice. I’m so frustrated by the growing conflict of interest in reviews. Especially on Amazon, where it’s nearly impossible to find legitimate opinions on lesser-known/unknown brand names. Silly things like finding a new type of light bulb turn into an hour long quest of scanning reviews for the ubiquitous “I received a discount in exchange for my review”…so I end up going with household name brands, that I know don’t do the discount game, but I miss out out on small less known brands that may be better quality, have better ethics or are cheaper! Argh! I’m derailing a bit, so I’ll correct course: your transparency is much appreciated! Happy to hear this is working out for you and the team. That is a very tough decision to make. This is great news to me, but chances are I’m not going to be as interested in buying lingerie i can’t afford… Assuming your staff tends to buy lingerie that is reasonably priced. I love seeing and hearing about new fancy pieces, but if i can’t afford it, it’s just eye candy, and it’s not really doing anything for sales… aside from pushing the design envelope in the competition. Though i suppose that might come in the form of trade shows and other events. I’m just happy to see the team is still going strong. Looking forward to seeing what’s new this year. This is very very smart decision Cora! BTW On the polish blogs in every corner you can read that one of the option in cooperation blogger – brand is exactly paid review. I always thinking this is strange from the beggining. Fortunately, TLA is different :) I wish You and all TLA group all the best! YES! And I say this as someone on both sides of the coin: a consumer and a brand. As a consumer, I think the benefits of independent reviews are obvious. I did always appreciate your disclosure policy, but this is way better. As a brand, I much prefer it when reviewers are interested enough in my product to buy it independently, rather than me sending product and having no influence over what happens after. I prefer to either get free, honest feedback (that’s a perk) OR, if I want some influence over how my brand and product are presented, I pay for it. I think this is a great step and am excitied to see how these changes pan out! Definitely appreciate the transparency around review policies. Rejecting any conflict of interest in reviews also seems like a better long term strategy. Personally, I’ve long since stopped following various online fashion/beauty bloggers and YouTubers because despite disclosures, everything feels like a new style of advertising. I had no idea brands could be so childish as to harass someone for a negative review! Definitely the right choice to stop accepting samples, then. If that can happen to TLA I don’t want to imagine what it’s like for smaller blogs. I always trusted TLA’s reviews, and since you disclosed when you received something they never felt like ads. I love that you let each writer choose how to do them and aren’t imposing a certain tone. I think it’s that brands are used to getting their way and also used to no one questioning them when they ask for certain things. When I was a newer blogger, I probably would have thought very differently about brands asking me to write our reviews to their specifications (especially because I wouldn’t have known any better and that kind of behavior is normal for other niches). I think this is a case where starting earlier (and being ignored at first) helped TLA to develop its voice and point of view; by the time lingerie brands started sending review products to bloggers, I’d already been around for a few years and decided what our reviews should be. And yes, I feel very strongly that our reviews should represent what our writers really think, and so I try to be as hands-off possible. I’m also lucky in that our Assistant Editor Krista feels the same way about reviews as I do. Wow. I mean wow. Good for you. We will read your reviews with even more interest. I had noticed the change as well and I think it’s great! Thanks for sharing with us! I had wondered about why we were seeing fewer articles as well and now I know! I think you’re the best and thank you for all your hard work and honesty. The only product review publication I use is Consumer Reports for the exact same reason; they also don’t accept products or “assistance” or influence to the reviews. I never felt that TLA copped out and was a voice of the labels, but it shows more integrity to see the official mindset. Kudos to you and the staff. I’m so flattered you would put us in the same comment with Consumer Reports! They are absolutely the gold standard, and I’m glad you approve of our stance. Whilst I don’t think it’s the right thing for my own blog currently, I do think this is a very admirable policy to have :) I’ve always trusted TLA’s reviews anyway, but it’s nice to see that they’re now totally independent from advertising. You’re the only blog, lingerie or otherwise, that I know of that’s made this change! Most when they get big start charging money for reviews, and that just makes it even more of an ethically grey area. Charging money for reviews has always felt like a conflict of interest to me. At that point, because money has changed hands, it is almost certainly an advertisement, and even if you say your opinions are your own, I can’t help but wonder if or how monetary compensation affects what you share. And, of course, I think at that point, brands might reasonably expect to only have a positive review written about them. Thank you for saying you’ve always found TLA’s reviews to be trustworthy! I’m glad to hear that.